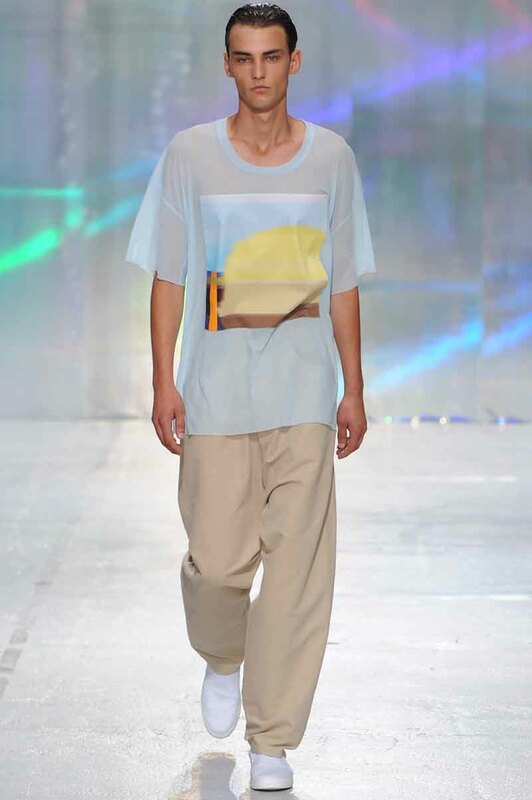 PARIS, Jun 25, 2014/ — Sans artifice, 22/4 Hommes Femmes designer Stephanie Hahn crafts quiet clothes imbued with a sense of light balance. Departing from a tailor’s savoir-faire, precise construction grounds a refined, pragmatic wardrobe– engineered patterns reformulated for women and men to appear identical. The thread of sportswear is woven through an intrinsic classicism, elevated by noble materials and meticulous finishes. A simple equation (2+2=4) accentuates the greater philosophy of dualism and purity in Hahn’s gender-liberal design approach. Taking cues from a fractal landscape of light and sound, the Spring Summer 2015 collection evolves from an obsession with musical subcultures and modern art to fuse the loose, fluid volumes of a Miami hip-hop uniform with 22/4’s strict, tailored silhouette. A sun lit palette is awash with the pastel shades of William Turner, as sky blue and pale mandarin tones play against earthy beige, optic white and the industrial glare of reflective silver. In partnership with London-based print designers Jo Simpson and Mark Thompson, a patched print features abstract solar flares merged with digital mosaic. Looking back to Newton’s prism studies and the Theory of Colours by Goethe (1810), this dynamic interplay of light and darkness arises from the anachronistic clash of past and present throughout the collection. The ample silhouette is crafted through fluid tailoring, square shirts and boxy tunic tops in sheer and opaque textiles. Outerwear is blocked in contrasting fabrications, from sky blue wool streaked like watercolour canvas to paper-touch cotton, fine mesh and airy linen blends. Subversive details abound, with sports toggles cinching blazers, clipped belt bags, and the signature 22/4 exposed collar stays rendered in iridescent Perspex. A passage of women’s wear silhouettes continues the languorous silhouette into floor-length skirts in swathes of denim and faux python, worn with a sleeveless tunic, trench or apron top. The dark finale of ‘Roten Teppich’ evening pieces are sliced with dark denim, for a new tuxedo. A post-industrial electronic soundtrack by Factory Floor (DFA Records) re-contextualises the collection’s classical elements through Stephanie Hahn’s contemporary lens.